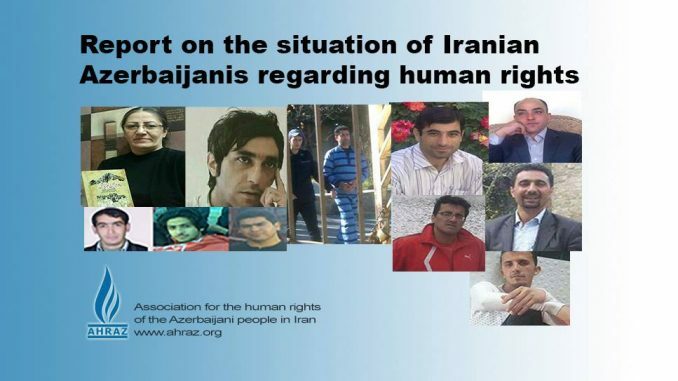 On 15 October 2017, the Revolutionary Court in Ahar, northwest Iran, sentenced seven Azerbaijani Turk civil society activists to imprisonment. According to the verdict, Mr. Saleh Molla Abbasi, Mr. Ebrahim Nouri, Mr. Akbar Abolzadeh were sentenced to ten months in prison and Mr. Esrafil Fathollahzadeh, Mr. Hamed Allahverdipour, Mr. Morteza Shokriwere, Mr. Soleyman Kazemi to seven months in prison. The judge of the court Mr. Ahrari convicted them of the charge “participation in gathering and colluding to commit crimes against national security”. However, the court exonerated the Azerbaijani Turk civil rights activists Mr. Jalal Derogari, Mr. Majid Naghizadeh, Mr. Morteza Safari, Mr. Mehdi Zanjir bolaghi, Mr. Arash Jafari, Mr. Akbar Jahangiri, Mr. Alireza Changizi and Mr. Vahed Bastami from the same charges. All the activists mentioned above had been arrested in connection with “antiracism” protests on 12 November 2015 in Ahar. In November 2015, Including Ahar in many cities of Azerbaijan (northwest Iran) and Tehran there were a demonstration against the TV program of “Fitileh” in which the Turks had been humiliated. These demonstrations are known as “anti-racism protests”. Police in Iran clashed with protesting people, fired tear gas to disperse crowds in several cities, many protesters were arrested. In addition, the court also exonerated the 18 other Turk Mother Language Advocates from the charge of “membership in opposition groups with the aim of disturbing the order and security”. They had all been arrested at the ceremony of international mother language day that had been held on 20 February 2012 in Ahar. 21 February, the international mother language day is one the commemorative days for Iranian Turk activists who struggle for the right to education in mother language. Turks in Iran are deprived from having school in their own language and the activists celebrate the mother language day advocating their demand for this right. Azerbaijani turk civil right activists, two brothers namly, Beitollah and Yadollah Barzegar, were imprisoned fo 182 days. According to reports, Azerbaijani Turk civil rights activists, Baitullah broders from Khyav city (Meshkinshahr), have been sentenced to 91 days of imprisonment for publishing lies. Mr. Molaee, the chairman of the 101 Criminal Court of Meshkinshahr, issued the verdict on charges of ”disturbing public opinion”. Baitullah Barzegar is a well-known activist of the Azerbaijani civil Movement, who has been prosecuted by Iranian security forces for many years due to his civil rights activities. Mojgan Sayami, the director and owner of Saray magazine, was arrested by Iranian security forces in her own house. According to reports, security forces arrested and transferred Ms. Siyami to an unknown location on 22 October, 2017 from her house. So far, the reason for arresting this cultural activist and editor has not been determined. Ms. Sayami is a cultural activist, author and director of the Sarar magazine. She was one of the candidates for the 12th presidential election in Iran, which was disqualified. Naser Khulusi, an Azerbaijani civil rights activist, was arrested Monday morning on 30 Oct 2017 by security forces at his father’s house. Naser Khalusi, was arrested by the Ministry of Intelligence and transferred to the Tabriz Public Prosecutor’s Office on the morning of 30 Oct 2017 in order to imprison him for 6 years imprisonment. Naser Khlusi, an activist from citizen of Tabriz, was sentenced to 6 years imprisonment by the Second Branch of the Urmia Public Prosecutor’s Office on 28 Jun 2017. The charges against him were “propaganda against the regime” and “disturbing national security”. Earlier, Naser Khlusi was arrested on 23 January 2017 by security forces on the Tabriz-Urmia route. He was temporarily released on bail of 500 million RRI after 23 days of arrest in the Tabriz Revolutionary Guard. He was reportedly subjected to physical and psychological torture during these 23 days. Azerbaijani Turk civil from Ahar city, Akbar Jahangiri were sentenced to 4 months of imprisonment by the Ahar court. According to a report, Azerbaijani Turk Civil Rigts Activists, a resident of Ahar city, Akbar Jahangiri has been sentenced to 4 months of imprisonment by Ahar Branch 1, Criminal Court, according to Article 500 of the Islamic Penal Code with charge of ”propaganda activity against the Islamic Republic of Iran” was sentenced by Judge Nazari. Need to be mention that, the aforementioned people were arested by Iranian forces, the day before the last Friday of Ramadan in 2016, as they advocated Uyghur Turks, Bayerbujaq and Qarabagh’s people rights. Eventually their case filed a criminal by A Hair’s security forces. They were temporarily released during the trial.